4th Legal Empowerment Leadership Course 2018 is Out Online. 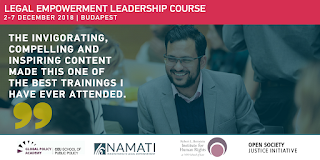 4th Legal Empowerment Leadership Course 2018… This December, Namati is bringing 60 inspiring voices together at Budapest’s Central European University for the fourth annual Legal Empowerment Leadership Course. This gathering is an opportunity to learn from first-rate faculty, tackle challenges we face in our work, and grow the movement for legal empowerment together. The Legal Empowerment Leadership Course cultivates a global cadre of leaders who are committed to legal empowerment and share a common understanding of our field. The course, which will run from December 2nd till December 7th, is co-sponsored by Central European University’s School of Public Policy, the Robert L. Bernstein Institute for Human Rights at New York University School of Law, the Global Legal Empowerment Network, Namati, and the Open Society Justice Initiative. Scholarships are available to a limited number of applicants on a competitive basis. Note that scholarships will not be available for applicants from donor institutions. Open to practitioners, policymakers, donors, and researchers. Academics and researchers interested in working with legal empowerment programs.